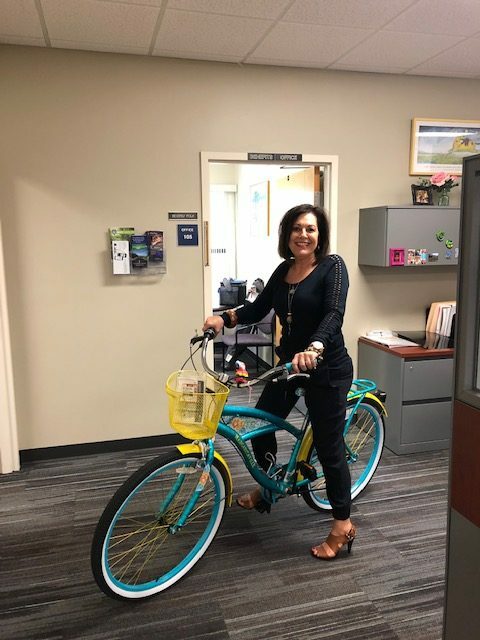 The beach cruiser is one of the door prizes available for participating in the SF employee health screenings (Beverly Polk is NOT included in the prize package). March 21, 2019 – Santa Fe College’s annual health risk assessment biometric screenings for full-time employees who are in enrolled in one of SF’s group Florida Blue health care plans are scheduled for Wednesday, March 27 through Friday, March 29. SF employees can cruise on over to HR to see what you can win after getting your health risk assessment, including the beach cruiser pictured to the right. Participants will receive a voucher for a FREE Subway lunch and will be entered into a drawing to win additional door prizes. A health risk questionnaire will be online and can be completed in advance in order to save time. Employees will log onto the Florida Blue website and complete the personal health questionnaire by clicking on the “Get Started” button in the “Your Guide to Better Health” section. You should complete the personal health questionnaire prior to the day of the biometric screenings, but computers will be available on site for those who do not complete the questionnaire in advance. For your convenience, the online site opened March 1, and remains open through March 29, 2019. Detailed login instructions are included with this notification however, if you need assistance please contact Human Resources. Once completed, log on to pickatime.com/SantaFeCollegeHealthFairSched and schedule a biometric screening appointment. You will have your blood pressure, blood sugar and cholesterol levels tested and be able to discuss your results with a health care advisor.